Image the following scenario: you are visiting a friend’s house and you really like the color the walls are painted in but your friend just can’t remember what that exact color is. But you want to know that color because you want to paints your bedroom walls in the same color! 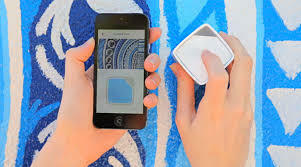 The SwatchMate Cube is a small cube that captures any color, just by placing the cube onto the wall (or anything else!) with the particular color you want to know. SwatchMate will then wirelessly display the exact color onto your smartphone screen. Problem solved! For more information and to pre-order, click here.